Something to ponder deep on Priests and others doing kainkaryam at Temples. When we travel as a family to those places ~ the priorities perhaps are : first cosy stay at some good hotel; good breakfast; comfortable travel ~ then rush of temples. Many visit temples as if the only purpose to tell others /make a dairy entry – of having visited so many temples. One expects, wishes and wants things in the way they want – the temple should not be crowded ~ they should get priority darshan and rush out as immediately as one entered. Some do not have time to have darshan in many of the sannathis other than the Presiding deity and those of Azhwargal and Acharyaras, who have passed on the lineage and the tradition to us. Many of the temples in remote areas do look forlorn, not frequented by people, they are unkempt and not properly cared for. We do not miss to make a complain that ‘people are forgetting heritage and fail to appreciate their religion’ ~ an instant showpiece comment without introspecting what we have done and how much we have contributed in every form – the thoughts, coordination, strategy, contribution, physical activity and fighting in the forums when trouble frequented. From their pristine glory, some of the Temples have fallen… nothing has changed ~ it is the same Divyadesam or a puranic temple, sung by Alwars / by Nayanmars [padal petra sthalams] and other temples of historic and spiritual significance. Remember that a small group of people have still remained doing yeomen service [kainkaryam] in the temple. In every such olden temple, there is the Priest, those who do the service at madapalli [cooking food for the Lord]; singing the hymns [Sri Naalayira Divyaprabandham in Sri Vaishnavaite temples and Othuvaars in Saivaite temples]; those who play Nadaswaram and Thavil; the cleaning staff and more. The Society which spends in hundreds for parking vehicles in malls and spends thousands for a few hours in mall, cares little ~ remember many of them do not even get what is spent in mall in hours as their monthly pay…….. but ~ still there are some selflessly and whole-heartedly doing service to the Lord.. They have been doing this, not for what you offer, the little amounts that you give when you visit the temples ~ the salaries are too meagre. In Tamil nadu, Temples are controlled by Hindu Religious & Charitable Endowments Dept – a wrong statement at that. They are actually administrators of property and that too, only in respect of temples where hundial income exceeds prescribed minimum – other temples are neglected. Those with high income flow would have many staff and the salary levels are fixed according to the income of the temple. We follow time-bound rituals and have sacred things to follow. The Archargar and other Kainkaryabarargal often spend out of their pocket, remain poor but are extremely dedicated and happy that they have chosen to serve the God. They feel the temple is their place, they are destined to take care of the Lord there ~ cleans the Garbagriha, dresses the Lord with the available new clothes; do timely poojas; offer thiruvamuthu [the food] at prescribed timings; provide darshan and archana when devotees visit, closes the temple in the AN ~ back again in the evening, till night ~ only to follow the same, the next morning. It is primarily a very small set of people, who have been so engrossed into serving the Lord that our Temples are still what they are !! ~ next time, when you visit an ancestral temple, take time to talk to the Battar [Archagar / Gurukkal] or to others doing service ~ there could be a pattern. It is passed on to them from ages ~ a family tradition. The father remains steadfastly committed to the Lord and refuses to move away, even when his children find greener pastures in the cities of Chennai, metropolis in India ~ and abroad in Australia, Singapore, USA, UK, and Gulf……. They would not move ~ they would not be interested in attending even functions, if it were to leave the Lord even for a day. Great souls. In a few cases, when they turn very old, no longer able to continue their services or when they fall ill, a good son might return to look after the great father ~ some do not go back. Having come to their ancestral village, they suddenly feel the urge to serve, take over the mantle from their father and continue the services with renewed vigour, throwing away their position or good job…………….. this is true and I personally know of more than a handful of such noble souls. With this background, an article in ‘The Week” Dated: Monday, December 31, 2012 titled “Why does a nuclear physicist or a molecular biologist become a temple priest?”. Do read it for yourself, though it might slightly differ in connotation. They are highly educated and could get jobs anywhere. Yet they have devoted their lives to the service of God. Priests in big Indian temples have always been known to be erudite—they have been well-versed in Sanskrit and some other languages, and masters of vedic scriptures. For most priests, service of God is a tradition that is passed on from one generation to the next. So, most accept the role without any complaints. There is not much money in the profession unless one travels abroad, but in many temples, a priest who has crossed the seven seas is not accepted back. Things, however, are changing. With a steady rise in demand for priests abroad, the temples are rethinking their stand. So, a homam here and a puja there, and you get your job back. The money may not be good, but what keeps most rooted to the job is this belief that they are among the lucky few who share an intimate relationship with God. Their families, too, share the belief. Their wives accept their role and follow the rules without any question. Many of the women are well educated and have regular jobs, but when it comes to serving God, they are as committed as their priest-husbands. Things have, however, changed for the younger generation. While earlier they were not given a choice, today a child may take up the family occupation or do something else. Also, serving the temple no longer remains the right of a particular family. In fact, many 'outsiders' have made their way into the inner circle. THE WEEK profiles six men who have devoted their lives to the service of God. Sreedharachar : Worked with Co-optex. Is now a priest at the Sri Lakshmi Narayana Temple, Tamil Nadu. Pullikundram, a small village off the Mahabalipuram coast, a stone's throw from the famous Thirukazhukundram Temple, is home to the Sri Lakshmi Narayana Temple, said to be built between 1509 and 1529. It still has its ancient gateway and roof intact and has been Sreedharachar's family temple for six generations. A miracle bolstered his belief that he was fulfilling a divine calling. Married for 14 years, Sreedhar and his wife, Sudha, had no children. They consulted many doctors, but to no avail. 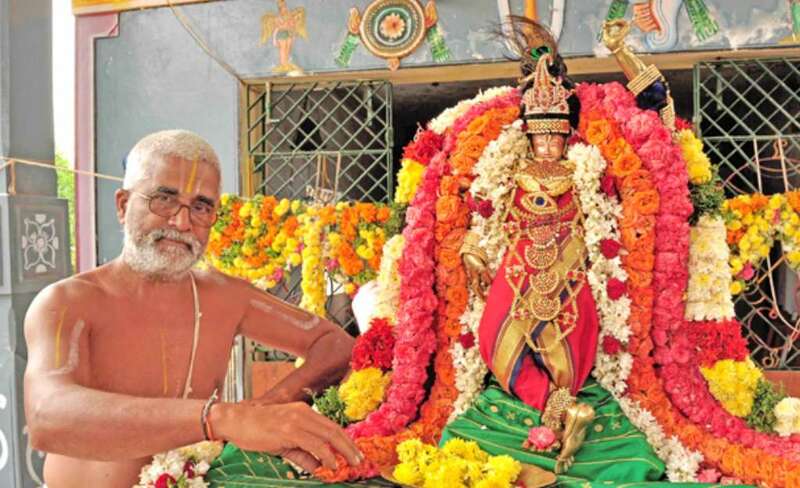 But within days of Sreedhar agreeing to look after the temple, his wife conceived. 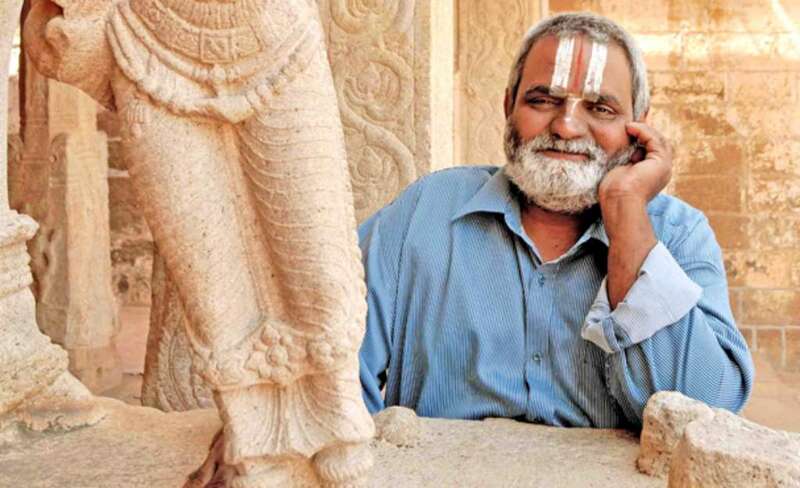 He now has two sons—Laxminarayana, who is in Class V, and Sowmyanarayana, who is in Class I.
Muralidharan Battar: Works in BHEL and is also an archakar at the Sri Ranganathaswamy Temple, Tamil Nadu. Walking through the Sri Ranganathaswamy Temple is like walking through a maze. The temple perimeter is where the town flourished in three tiers, with gates to show direction. Houses here share walls, but the residents don't complain because they have the perumal's darshan (the Lord's sight) every day when the idol is taken through the streets for the perambulation. Better known as Srirangam, it is the foremost of the eight self-manifested shrines (swayam vyakta kshetras) of Lord Vishnu. It is also considered the most important of the 108 main Vishnu temples. Spread across 156 acres on an islet between the rivers Cauvery and Kollidam, the temple has 21 towers that provide a grand view. Muralidharan Battar, 55, is one among several Battars (a community of priests) serving the temple. “It is something that my family has been doing for generations now,” he says. “I was the first widower to enter the sannidhi (sanctum). When my wife died, I wanted to commit suicide but my father prevailed over me and here I am.” Murali works in Bharat Heavy Electricals Ltd. Every day, he travels 60km to be at the temple. “My workplace is nearby and I can take leave and I do it even at loss of pay but I will not miss a day at the temple,” he says. It was during the MGR period that the hereditary system of appointing priests was abolished. 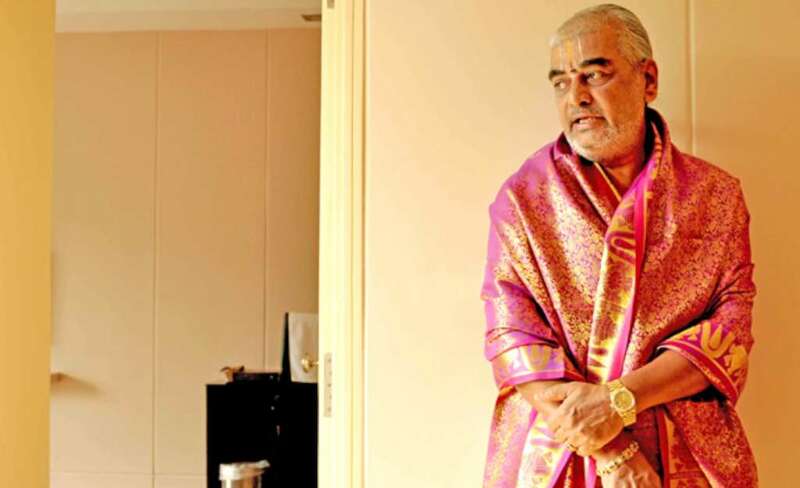 But, Murali has got his son Harish into the temple and says it is now his responsibility to carry out the duties and continue the tradition. Harish, 26, is a mechanical engineer and has done his MBA in finance from Coimbatore. “It took me 12 years to learn the vedas, agamas [a traditional doctrine], decoration, pujas and customs of the temple,” says Harish. He doesn't consider the duty a burden. In fact, he thinks it is a privilege that only a select few enjoy. Dr V.S. Gounder, : Ph.D in nuclear physics. Serves at the Sri Ranganathaswamy Temple, Tamil Nadu. Reluctant to talk and almost reclusive, Dr V.S. Gounder has the task of getting the holy water from the Cauvery and distributing it among the devotees. His family has been involved with the temple for years now. He did his Ph.D in nuclear physics at Indian Institute of Science, Bangalore, and returned to his native village to take care of his ageing father. He has published 18 papers and is a guide to two doctorate students. He travels abroad quite often. In fact, between 1996 and 2001, Ayyapan Kurukal was serving at a Ganesha temple in Malaysia and the next three years, he was at a Murugan temple in Washington. Ayyapan is a second generation priest in his family. His father, Muthukumaraswamy, was the head priest of the Vaitheeswaran Temple, dedicated to Lord Shiva. But ill health forced him to quit. Now, the responsibility has fallen on Ayyapan's shoulders. Ayyapan is happy with his job. “I think my job is the greatest in the world,” he says. “I have two sons and I would want both of them to join this work. But we will have to wait and see.” Though travelling abroad means more money, Ayyapan does not enjoy it much. “I do not like to go abroad,” he says. “After all, money is not everything. It does not stay with us forever.” Like it or not, he travels up to four times a year. Ayyapan has a brother, who has finished his education and is now settled in Germany. “I, too, was good at studies,” says Ayyapan, did his BCom. But when his brother refused to step into their father's shoes, Ayyapan decided to do it. “My grandfather asked me to take up this profession and I obeyed. I have no regrets,” he says. 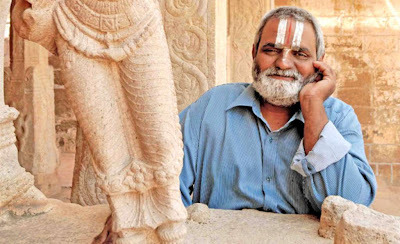 When we met him, 73-year-old T. Ramalinga Deekshitar was taking rest at his home, which is literally at the gate of the temple. The room was spare but for a cupboard that contained his books. 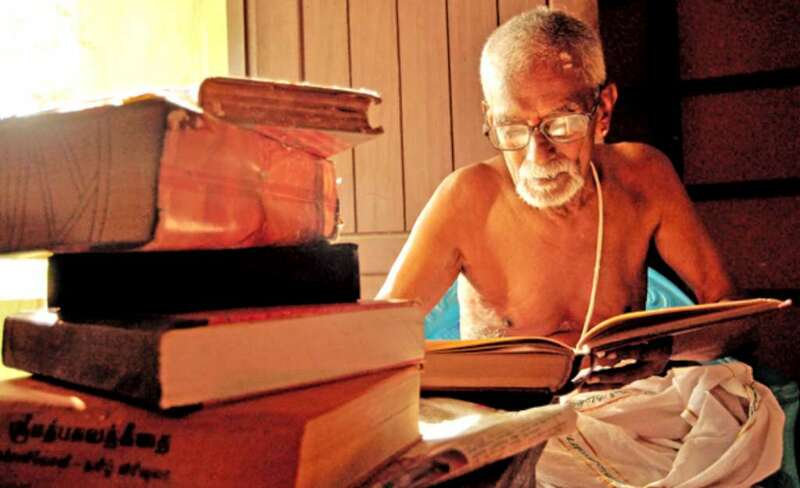 A well-read man, he did his MA in Sanskrit and doctorate in the study of the 'Chidambaram Temple as recorded in Sanskrit literature'. Showing a copy of the doctoral thesis, he says, “Look at it and be worshipful”. 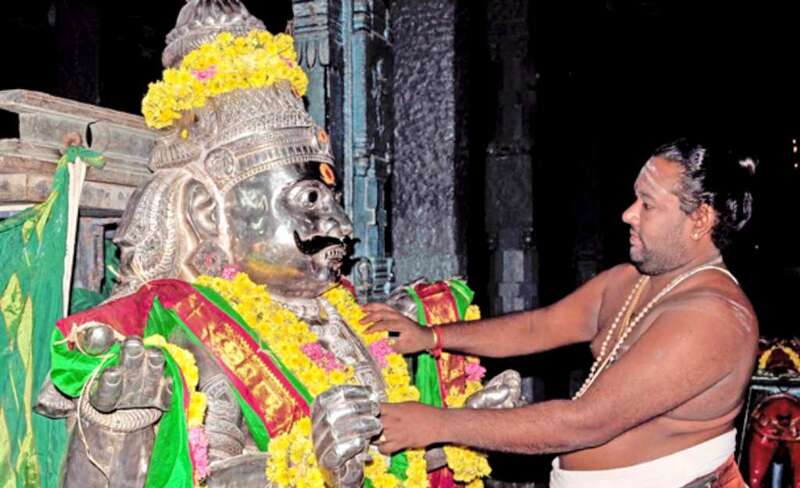 Ramana Dikshitulu : Chief priest at the Tirupati Temple, Andhra Pradesh. I totally agree with all you had written with a bit of shame that I could not do anything for my religion. Probably it is God's will. I dont analyse anything in my life. It is God's will. All I do is chanting His name as told by my acharya. Adyen Rajan at the age of 53 what to start doing some kind of service to Vaishnava temples. Due to various reasons, I am zero in day to day activities as aBrahmin. Am I qualified to become as aArxhagar, if trained. If so, kindly suggest me the right person or location where I can contact?